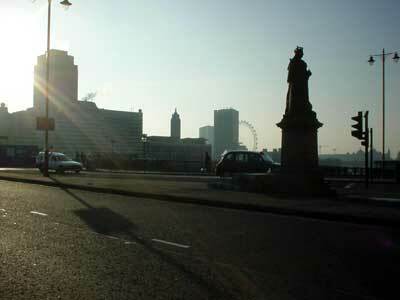 Blackfriars road bridge, with the OXO Tower and Millennium Wheel in the far distance. This fine bridge was built between 1760-9, and at the time was only the third bridge to be built in the London area. A statue of Queen Victoria can be seen on the northern side, with the OXO Tower and Millennium Wheel in the far distance.